Should I Become a Sheriff? In many ways, Sheriffs are quite similar to Police Chiefs. Both are responsible for handling concerns of their entire departments – a county in case of a sheriff and a precinct in case of a police chief. Both these positions have a managerial role, in addition to being responsible for the general law enforcement within their jurisdiction. The differences arise in the detailed duties of the two and how they get to their position. Sheriffs are largely elected to their position while police chiefs are appointed by the Mayor, City Council or City Manager, etc. If you are interested in becoming a sheriff, you will want to know the steps to become a sheriff. These would include clearing some basic eligibility requirements, along with educational requirements. This would be followed by gaining some field experience and then eventually planning your campaign for running for the office of sheriff. Joining the law enforcement in any capacity is a long and extensive process. But if you have the right amount of passion to be a sheriff, following these steps to become a sheriff would not be difficult. Be at least 18 years of age – this requirement may vary from state to state. Live in the place where you intend to become the sheriff – many states require candidates to be residents of the area they want to become a sheriff in, for at least one year before application. Detailed information regarding this would be available on your county’s website. Be in a good mental and physical shape – sheriffs undergo a lot of physical and mental strain. Therefore it is important for them to have the ability to withstand all the pressure that comes with the job. You will have to pass medical tests with good performance. Going through the police academy will prepare you for the physical aspect of the job, including the ability to run, handcuff criminals and tackle people. Stress management and thinking on your feet are two qualities you will learn through practice and experience – therefore it is important to get plenty of experience before you run for sheriff. Should have at least a high school diploma or a GED. 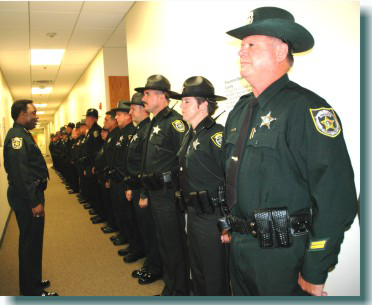 Gain some law enforcement experience: This experience would come in handy once you assume the office of sheriff. The exact experience requirements vary from county to county – some require at least 4-5 years of experience while others may only need one. You may also be required to get a police officer license or certification, as per your state’s laws. Note: Work experience in another field of law enforcement may be relevant too – for instance, having worked as a judge might help you waive off some of the police experience requirement in some jurisdictions. Even though a lot of states don’t make this an official requirement for becoming a sheriff, it is generally expected to make your application and election campaign stronger if you possess a higher education degree. Getting an associate, bachelor’s or master’s degree in criminal justice or any relevant field would make the voters feel that you are more qualified to head the office of sheriff. Once you have cleared these requirements, you will need to file the relevant paperwork before the deadline specified by your county. You will then be officially starting your campaign for sheriff. Make sure you are clear about your campaign goals and how you intend to convey them to the voters. If you are successful in the elections, you will be asked to take an oath of loyalty and will need to sign a contract. In most jurisdictions, sheriffs are elected for a period of four years. Strong communication skills – to convey information to your team effectively. Active listening – the ability to pay attention to what your team is saying and take into account all information before you make a decision. Critical Thinking – to be able to apply reasoning and logic in identifying the best possible solutions. Social Perceptiveness – to be able to understand why people react the way they do in different situations. Decision Making – taking into account the cost and benefits of different decision and choosing the most appropriate responses. When supervising an entire county, you will need to maintain your calm and assess various problematic situations in detail to arrive at the best possible solution. Leadership qualities would come in really handy when trying to maintain decorum within the workplace.